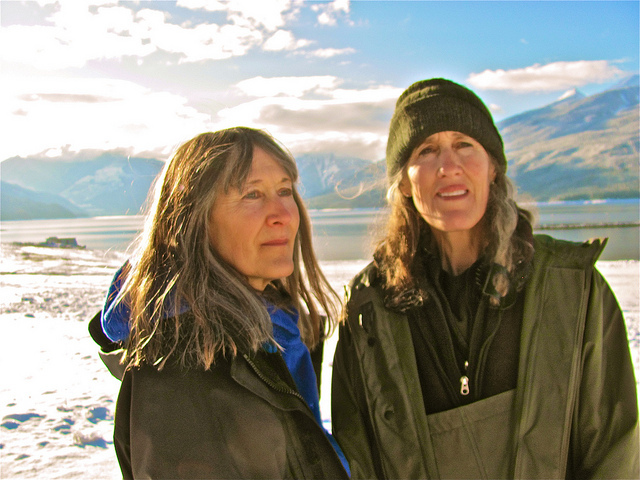 Crystal Spicer and Janet Spicer, Arrow Lakes reach of the Columbia River. Crystal and Janet Spicer were born in the Arrow Lakes valley in the thriving community of Nakusp in 1950. Their father, Christopher Spicer, served as a pilot in the British Air Force in World War II and completed a degree in Agriculture in Kent, England before arriving in the Arrow Lakes valley in 1948. Their mother, Jean (Waterfield) Spicer, had come to Nakusp with her family around 1912. She lived in the valley all her life, leaving only briefly to complete a degree in botany from the University of British Columbia. Her brother, Donald Waterfield, wrote two books concerning the Columbia River Treaty (CRT) and the losses to the upper Columbia River system: Continental Waterboy and Land Grab. Soon after high school, the Spicer sisters left the region. Janet travelled and worked elsewhere in the United Kingdom, receiving a diploma in agriculture. Crystal relocated to Vancouver Island and then Quebec, where she worked in forestry, fisheries and agriculture. Janet returned to the Arrow Lakes Valley in 1985; Crystal in 2010. Christopher Spicer had searched world-wide for the 60-acre farm he found in Nakusp. Its moderated climate (due to the adjacent Columbia River and Arrow Lake), the right soil, a warm (thermal) spring-fed water source, an adjacent market for produce and the right sun exposure. During the years of Canadian controversy about the CRT, a District Agriculturist claimed there was no comparable farm in BC that had all the agricultural attributes of Spicer Farm. As a result of the CRT, Spicer lost access to not only his richest arable land (ten acres now under reservoir water), but also the remaining acreage of pastures and hay fields (now for a relocated highway and power transmission lines). Crystal Spicer (C): Our parents always walked lightly on the planet and spent their lives living consciously and ethically. This laid a path for me to follow. Retaining memory of the past ensures that the chain of understanding is not broken. Historical facts need to be kept alive in order to be able to right past wrongs. I’ve always carried the losses of the river and all that is connected due to the Treaty dams but I did not see any real opportunity to take action until the last decade. Janet Spicer (J): Crystal and I are two of the very few survivors of this “burn-and-drown” holocaust who remain in this Valley. It makes an enormous difference to have actually lived, as young adults, through the utter destruction of one of the planet’s great life-support systems – the free flowing Columbia River as it was on the Canadian side — and to witness its aftermath. As horrifying as it was from a human perspective, the magnitude of death and displacement within the Natural kingdom of plants and animals was infinitely greater. With some 270,000 acres of valley bottom inundated by the Treaty dams, animals either drowned or starved to death in their tens of thousands. C: In 2007, while living in Quebec, I attempted to revive awareness of the impacts from the Treaty by sending submissions to television networks to take on stories of the survivors of the trauma of dislocation so that this publicity might perhaps result in some concessions for expropriated victims. However, the Columbia River Treaty just wasn’t a big enough story for the media at that time, and none of my ideas or proposals were accepted. After 42 years of living away from the affected Columbia River valley and the pain of its destruction, I moved back to it. The timing was coincidental and happened as the Treaty public review process was beginning. The first public conference that I attended was in November, 2012, in Nakusp. I came away from it feeling utterly betrayed and frustrated by the presentations delivered by the Province and BC Hydro. Government cited their own agenda and did not give the public adequate information. There was minimal opportunity given to the audience to provide input. The focus of my work is to restore habitat for non-human residents of the Basin. No amount of dollars for artificial propping up of ecosystems and the environment such as altering genetics, nutrient programs, spawning channels, and so on can work without restored and protected habitat. The cities that use the hydropower are far away. Being here, living in this valley, one can’t help as a human being but feel acute distress, when you think that 24 entire communities were burned and drowned. It’s hard to forget. C: Public awareness was severely lacking in the Valley where so many decades had passed and information and memory had simply disappeared with the time. The Arrow Lakes region barely had a political voice any more. The only way I could see a public awareness campaign happening was to start one myself. I was terrified of public speaking but there was a big turnout for the first meeting that I organized, which gave me the impetus to continue. I held a meeting in each of the four communities that survived or were built after the flooding along the Arrow Lakes. Residents came from other regions of the Basin as well. We called ourselves the Columbia River Treaty Action Group and started a website in the spring of 2013. Others from outside the valley joined our cause and I marveled at the empathy from so many who had never been personally impacted as our family had. Government public meetings continued, producing much the same frustrating results of information fog. Most of the meetings were held in communities that had never been negatively impacted, and it was difficult to travel these distances to participate. We lobbied the government and were granted a bus to attend a consultation meeting in Castlegar. This was the first meeting where representatives of the US Army Corps of Engineers and Bonneville Power Administration (BPA) from the US also delivered presentations. We were utterly dismayed that when questioned by the audience, the BPA representative responded that the Treaty storage in Canada had negligible value for U.S. irrigation. Next I brought in acclaimed agronomist and international speaker, Wendy Holm, to Nakusp. I knew Wendy through her regular column in BC’s farming journal “Country Life in BC” where she tirelessly explained that water was indeed a tradable commodity within the Free Trade Agreement, despite our federal and provincial politicians’ insistence that it was exempt. Furthermore, Wendy exhorted British Columbians to understand that any changes to the Treaty would include that water into the FTA. I flew Wendy in from her home on Bowen Island in April for another evening to bring Valley residents up to speed on the effects of the Treaty here in BC and in the US (Wendy’s place of birth). Perhaps her greatest value lay in her connection to two international trade lawyers who were to make a valuable contribution later. Meanwhile I was approached by a young 28-year old two-term municipal councilor, Joseph Hughes, from the Village of Nakusp who said he had attended Sid Parker’s talk and felt inspired to run as an Independent candidate for the May provincial election. I said that I would fund his campaign to the best of my ability and assist in maximum exposure. Though he did not win, he followed Sid Parker’s advice to the letter. The imperiled Columbia River and the Treaty became focal points at every All-Candidates forum. Without him, the issue would never have been mentioned. The fourth (“Treaty Terminate”) alternative caught the attention of both the Province and the audience. It gave a sketch of a moderated mid-elevation reservoir that would be relatively stable. At my urging, the engineer included the fact that this scenario would actually allow greater generation of hydro-power on an annual basis than the current Treaty regime. I also offered the suggestion that it may be possible to work this concept into a “Treaty Continue” plan. During one of our telephone meetings with the corporate lawyers, I had asked them could they please attend the Fauquier meeting. They had agreed to do so. The provincial government representatives were very surprised to see them there, as they had been pressing us to keep the meeting extremely local. At the end of the meeting one of the lawyers rose to his feet and summed up eloquently the reason for substantial changes to the operation of the dams: economic, social and cultural, ecological. He had empathy for the issue and was so professional. This gave our movement validation and credibility in the eyes of the government and B.C. Hydro. We could not afford to retain these people to keep working for us, but they helped enormously at the time. C: The corporate lawyers offered to meet with us later that evening. Out of that debriefing came the suggestion that we form a registered society and go trans-boundary. We became the Columbia Basin Revitalization Coalition. Our first known supporter from the US also attended the Fauquier conference. Virgil Seymour, who represented the Sinixt (or Arrow Lakes Indians), a trans-boundary indigenous people who had suffered cultural genocide when the Canadian Government declared them extinct in the late 1950s. Virgil spoke eloquently of the serious issues his tribe has with the Columbia River hydro dams. We have worked with Virgil on a continuous basis since. C: A significant breakthrough came when John and Rachael Osborn of the Sierra Club and the Center for Environmental Law & Policy both agreed to come to Nelson, BC, in November 2013 and chaired a first official trans-boundary meeting of concerned citizens. A new bi-lateral organization was formed called the Columbia River Round Table. This expanded the focus over the entire river basin and targeted ecosystem health. John Osborn has chaired bi-lateral meetings with us every month since that day and we are greatly inspired by his dedication and leadership. J: I though it was time to turn my Columbia River awareness campaign to the United States. In spring, 2014, I wrote a letter called “Silent Spring in B.C. – the Columbia River Treaty” and we mailed it to every paper in the four States that benefit from Canadian storage. The response was gracious and touching, such as “how shocking”, “I never knew”, and “what does mid-pool mean?” We also sent this letter out to BC newspapers. About the same time, I applied to become a member of the B.C. government’s Columbia Basin Regional Advisory Committee (for B.C. Hydro reservoir operations) and I was chosen. I now participate in four meetings annually. C: There is so much emphasis on climate change and how we must structure dam operations accordingly- but do we understand that dams are causing climate change, as in the case of Williston Dam in northern B.C., so large that it warmed the climate around it, resulting in vast beetle killed forests and degraded caribou habitat. In British Columbia and the US there many champions working hard to try to restore a river abused half a century ago, while the current BC government is set to repeat the same era of dam-building all over again by supporting Site C on the Peace River. We need to encourage a completely new intelligence. It has to be about preservation and sustainability and co-existing with the natural systems – we have a moral obligation to live consciously. Bigger and more is utterly unsustainable. We have reached the tipping point. Building big dams that flood agricultural land and destroy ecosystems in order to irrigate deserts should be seriously questioned. Building big dams designed to export power or supply domestic electricity for programs 10 years into the future is not forward vision. It is looking backwards – as if the technological age has stopped when really, it has only just begun. Downsizing and finding alternatives that do not impact the Earth must be the way forward if there is to be any future. Natural systems are interdependent and created perfectly to provide continuity. If one piece of the whole is disrupted, so, too, are many others. Disrupting the flow of a river seriously disrupts the balance and countless supportive ecosystems connected to it. There is a distressing lack of regulations or constraints in Canada for the protection of water and the environment. Our work in 2014 involved significant input during a Water Use Plan review for the Arrow Lakes region, plus continued modeling input, public awareness work, research, monitoring of ecosystem impacts, participation in government committees, and a continued effort to defend other rivers from similar exploitation. J: Right now, the entire valley is a world of decay and decline. The valley walls sloughing in continuously at an alarming rate, 83 species of birds either highly impacted or extirpated, 23 species of mammals – the same. All native fish species are in decline or are extirpated. Prior to the Treaty dams it was commonplace to see sturgeon the size and shape of submerged canoes basking in the warm shallows. They have all but disappeared. With no riparian zone there is no food and no habitat for so many living things. C: I remember the once mighty cottonwood trees in particular that lined the shorelines of this once magnificent waterway. They represented a healthy and diverse riparian system that had taken great ages to become so. I miss everything about them – their beautiful dormant silhouettes against the winter sky, the sweet fragrance of their buds heralding spring, their enormous silvery leaves turning to expose the underneath side warning of an approaching storm – releasing a summer “snow”” of their cotton-like seeds. Their stunning autumn gold cloak was their crowning glory. J: I cannot stress enough the importance of the riparian zone. It is absolutely critical to both the health of the adjacent water for which it provides nutrition and to the land beyond. When you eradicate the riparian zone there are no insects, no small fish, no wading birds, no insectivorous birds which in turn assure the health of forest life. We must somehow help the non-human element that has been so hard hit by these storage reservoirs. The riparian zone determines the health of the land above and the river below. Americans understand that. They have riparian protection. Canada does not have that protection. The storage reservoirs completely removed the riparian in this valley and others. They killed it. I feel that we ought not to believe that nature is all-powerful and all-resilient. In my observation she is very fragile, delicate and vulnerable. She needs great care. These two things: the value of riparian and the delicacy and fragility of nature. If Hydro and the government would be able to confirm these two things they might look at water development differently. C: There’s a 1998 photo of dad standing in the cabbage patch at Arrow Park as an old man. It was taken just a few weeks before he died. Today, that patch of land is all gone. It has sloughed into the reservoir. J: The walls of the valley continue to tumble in. More and more land sloughs into the reservoir. Acres and acres. Ours was such a professional farm in the valley. Manicured. Dad was a professional farmer. He had a degree in agriculture. Everything was beautifully and gently done. Dad would take the wagon and the horse and go around to collect chicken manure, horse manure, anywhere where there was a manure pile. That was what fed the corn patch. C: There was a beautiful orchard at the west end of the farm: cherry, apple, pear, plum. J: Potatoes always had one-third of the field. The farm produced 60 tons per year. Right from its founding in the 1880s, this farm provided produce for this town and the surrounding valley. We had food security. When we stopped growing something, it was no longer available. We supplied the asparagus, the corn, the iceberg lettuce. Everyone ate according to the seasons all up and down the valley – following this particular farm’s cycles. C: The fields’ irrigation ditches were gardens of bulbs. Birds would nest there. Each ditch was a complete botanical collection of things. Mom did it for dad. When he stopped to have a drink and rest, there would be a little garden to enjoy. It helped the whole system. Bees, pollinators. Everything exploding with fragrance. J: Beauty is such a wonderful enhancement to quality of life. And the birds! Remember the birds? Every tree shivered with them. One couldn’t hear for the sound of them. Now, there isn’t any. Crystal and I grew up in a valley that was vibrant and alive. The water moved. The fish. It was after the war. Everyone had work. No unemployment then. It was an economy building up. Dad said at the CRT hearings in 1961 that this valley was thriving and “all we need is one good road.” For access. The economy will continue to develop, he said. Please don’t flood this valley. It was poised for more growth. There was a sense of well-being. Nothing like today. C: Mom never stopped, even after the flooding. Kept growing flowers. Dried flowers. Money went to support 60 different charities. Supplied gift shops across Canada. She collected sand to dry blooms in. They hung from the kitchen rafters, even. J: This land has such a history, three farming families owned it before the Spicers. Dad dug down 16 feet and didn’t get to the bottom of the fertile soil that was here. To create that soil took hundreds of thousands of years, and good farming practices after that to keep it. Farming is all about permanence and continuity. To survive, to keep “farm status” after our fields were destroyed, I have had to buy or rent land to farm on. I bought land in Arrow Park on the west side in 1989 and farmed it for 15 years. It was not easy. One and a half hour drive there and back, including a cable ferry crossing. Then, early in the 2000s, the government re-located the Arrow Park road to put it straight up the mountain after Garnet Creek flooded. And then they cut the ferry service, so that it was very hard to access that land. I was always racing to get the ferry, trying to find people to do the work. It’s important to keep the farm going, even if our fields were flooded out by the reservoir. It’s also strictly political. If I keep growing the vegetables somewhere nearby, then the land here – Spicer Farms – will maintain its “farm status” under tax rules, as long as the vegetables pass through here to be sorted, washed and etc. We will be able to afford to keep this intact. Until Crystal and I can figure out what to do with this property, holding on to farm status will preserve it for now. It would be idealistic to think of the flooded land ever being recovered into a farm again. It can’t really ever come back. I would like our farm to be a wild bird sanctuary eventually. A wetlands preserve. C: The quiet suffering of my parents along with their strong determination to somehow continue with what they had left after the valley was flooded and to never give up has been a motivational force for me. The B.C. government bought or expropriated the titles on all farms, town sites and residences except for the Spicer Farm. My parents fought for and held on to the legal title with the hope that long after they were gone, the land they had title to could perhaps still make a difference someday – maybe for a wildlife sanctuary, a wetlands, or some other natural habitat that would be protected. They lived by the code that every bit of effort counts. J: This 1800s farmhouse where we are sitting had a burn order on it that B.C. Hydro forced Dad to sign. The house was to be burned upon his death. Strangely, Dad became good friends with J.W. Wilson, who ran the resettlement program for the Arrow valley in the 1960s and became president of B.C. Hydro. In 1972, polls showed that the Bennett government that brought in the Columbia River Treaty was certain to lose the looming provincial election. This meant that Wilson would go as well. The night before the election, dad contacted Wilson and asked that the burn order be revoked. Wilson acted immediately and the house was saved. Bennett lost the election. We are continually told that the “disastrous” flood of 1948 provoked the whole Treaty. The town of Vanport was built on the active Columbia River flood plain at an elevation of 15 feel below the lowest water level of the River. An annual flood is supposed to happen in the perfect design of things and a flood plain is clearly defined. It brings the much-needed nutrient charge into the aquatic world, it furthermore deposits a layer of fertile silt over the land to replenish and build up the valley floor. Dams and reservoir do exactly the opposite. They block off the distribution of nutrients along the river’s length, they prevent the deposition of silt on the hungry land. C: During the summer here in the valley, when the water rises unnaturally, it puts many people who live here into a depression. This is not a natural way. It’s caused by human beings and by greed. J: When the operation of dams alters the flow levels, animals receive no natural signs that a change is coming. These beings read the signs of a spring freshet, the annual flood on its way. They can feel the temperature drop. Acceleration of water volume. Sound. Electromagnetic fields even. They are in tune. In a natural system, animals know that things are changing. How can dams and their human operators mimic a natural system simply by drawing water up and down when power needs in cities dictate it’s time? At some point, we have to accept the moral responsibility of living within the environmental limits of this planet. The signs are loud and clear – a child can see when limits are overstepped. It comes down to a moral responsibility. Feeling good about what one does is more important than just being able to flick on a light. It has never been more important. The human race has reached the point where we are the most populous mammal on the planet. To still go on, half a century after the treaty was signed, resisting environmental redress is unconscionable. It is incumbent upon us to adopt a compromise and begin to restore the river on both sides of the line. There should not be a line, even. This is one river. C: As much as it has hurt me to watch a beautiful valley and living river so seriously disrupted, I’ve always considered myself to be one of the very fortunate ones to have lived the first 18 years of my life on the shores of the Columbia before the Treaty dams were built. It gave me a solid perspective on, appreciation for, and understanding of sustainable systems. If I can dedicate 18 years back to the river to see some restoration, I’ll be happy.